Of course Nobby and Maria Alvarez were the biggest favorites of this European Championship. Beside them, the two couples that Benedicte Emond (the new French Chef d'equipe) had chosen as individuals were also considered as very serious contenders. They were Pierre Fleury and Gregoire Tilquin. At the first vetgate, the battle for the first place had already begun. Nobby and Maria, Tilquin and Fleury were in the front. There was also another favorite who is always riding excellent horses. Last year she did well in Lexington with the German team; with the same horse she unfortunately crashed a bit during the last loop in Assisi two years ago, but now the horse has gotten more experience and was very strong. She is Sabrina Arnold; she lives in the south of France so the horse Beau was perfectly acclimatized to the grueling conditions. Another female rider did also come to play a role in forefront, Diana Origi, who lead the preride last year before that her horse pulled at the last vetgate. Unfortunately for the italian lady, her horse could hardly keep up in terms of recovery time and took everytime a few minutes more to enter the vetgate. In the front, alone, and opening the trail all the time, the extraordinary Kalifa from Abu Dhabi, ridden by his trainer Ali Khalfan. Amazing horse. Even if we had a hard time following the race by car - actually it was harder for the people following the middle of the pack riders than for the one going along with the leaders- there were very few grumpy guys to critisise the principles of the in-line race. Florac is an in-line race and has always be and must remain as it is! Otherwise how could the riders -and the crew and spectators- enjoy the scenery and the various going and trails. There were a lot of discussions about the way that the course has been adapted to get a faster average speed, about the manicuring of some very rocky trails (rock crushing), but everybody has to salute the work of Jean-Paul Boudon and his team. Let's all hope that his team will continue the good work and offer us next year similar conditions. For sure there will be a lot of riders coming for the next edition. The winning horse Kalifa is something like an extraterrestrial! Everybody - e.v.e.r.y.b.o.d.y - was betting at every stage on his future crash. We heard many times: "If he completes and win, I should better stop doing endurance riding and convert to golf or something else". By seeing Ali and Kalifa eating up all hills at the canter when others were taking them at the trot, of course, observers could only bet on the crash. Knowing also that this horse was bought in Uruguay where there are no hills. The horse was bought by Al Wahtba and went to Abu Dhabi. He finished second last year at the President's Cup and at the Maktoum Cup. In Uruguay he did decently, including a top ten at the PanAm in Costa Azul. It is obvious that this horse never saw the hills and mountains he had to cope with in Florac. So we had to stop pretending that we can still beat the Arabian riders in our technical races... Another lost illusion... And not to mentioon that Kalifa lost a shoe during the last loop. The rider had to put his easyboot, but this one was not fitting well so he had to stop several time to re-put it on. Alio Kalfan should come to the States learning the new easyglove technique!!! The French team was composed of Atger, Demedy, Santisteva et Goachet. Until the final trotting, that was Spain who hold the team gold; but the Spanish horse Arizona de Lafont was eliminated at the final trotting. Big dissapointement and big anger from the Spanish team, but it seems that the decision was correct. Anyway, they have got the silver. Belgium play his role in this game on the perfect way. There was no reason to fight in the front, but the 3rd place was perfectly within reach. Pietro Di Geronimo was chosen as individual when everybody was betting on him for the team, but only the trainer sees the horse during the pre-race clinics and at the trotting, so it's difficult to have an opinion. Anyway Di Geronimo demonstrated that his horse Mengali was perfectly prepared, taking the 9th place at the european level, his best placing up-to-now. 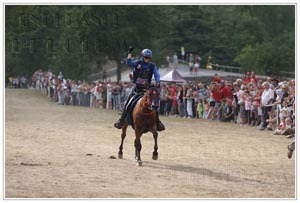 Belgium was shocked when Taborah, a difficult mare, was eliminated for lameness at the first vetgate. With only 3 horses in the team, no mistake was allowed. The three did very well, always together, cruising at a good speed, entering into the vetgate very fast. They finally completed the race in a tied finish, something that we -still- like to see. Team bronze for Belgium. The other nations did sometimes well, sometimes bad. Italy was just 10 minutes behind Belgium on the total of the three riders' times. Netherlands completed the team ranking at the 5th place whichis probably their best result. Germany was dissapointing taking into account the team bronze they clinched in Lexington last year. Of course Sabrina Arnold take the individual silver, but it is clear that jl Leclerc has still a lot of work. Slovakia didn't suffer any elimination and completed its full team, at the average speed of 13 km/h. Not too bad. Finally, the time has gone when the European riders could dominate the Arabian ones on their technical courses. Aue, Qatar and Bahrain has proven that they are the biggest challengers on any type of course. Qatar took 3rd and 5th place; UAE won; Bahrain did 12, 15 and 22.